What are Hallmarks in Jewellery Design? Comments Off on What are Hallmarks in Jewellery Design? You may have heard the term “hallmarks” when talking to a professional about antique engagement rings. 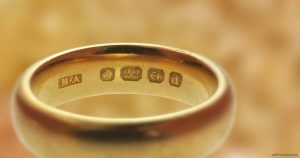 These hallmarks are a very important part of distinguishing a ring from an imposter, but they are also valuable signs of a ring’s history and manufacturer. Hallmarks are like a clue, a source of information that tells the jeweler what he or she is looking at. According to Cynthia Findlay Antiques, the “purity” hallmark is by far the most prominent and common of the bunch. This mark tells the jeweler or appraiser how much of which metals were used in production, and helps to guarantee that a ring is authentic. Since before Roman times, pieces of gold had been marked in order to denote something as authentic. You can imagine that without the technology we have today, it might be quite simple to duplicate a gold coin made of brass, or some lesser metal, and to use those counterfeit coins to amass a small fortune. Such fears existed too when art deco rings rose to prominence, so a good deal of the history behind a hallmark was designed as a rudimentary form of security. During the 1800s, researchers began keeping track of hallmarks. This practice has carried over to modern times, where there is now an extensive database of hallmarks a jeweler can reference to see where a piece came from. Custom jewellery from Toronto can have a hallmark added to it, but most mass produced jewellery doesn’t carry this kind of insignia. These marks are tiny, so a jeweler loupe with ten times magnification is required to see one and make out its distinct shape. If you believe you have jewellery that bears one of these marks, get it appraised! You may have a valuable piece on your hands.